For many of us, Saturday matinees were a staple of childhood. 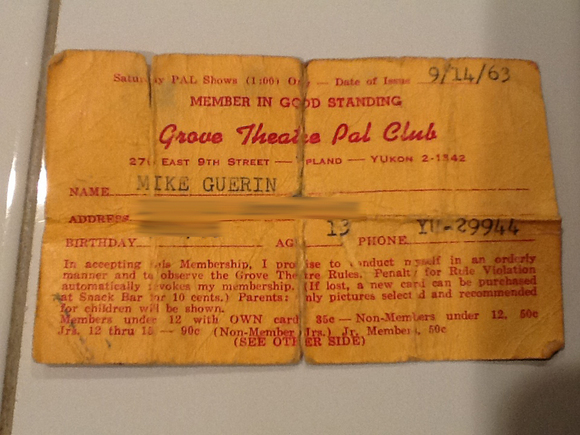 At Upland’s Grove Theatre, the ritual was formalized in the 1960s as the Pal Club. Kids got a membership card that would be stamped on the reverse on each visit. Mike Guerin found his card a while back while cleaning his garage. What an artifact! He’s like the Indiana Jones of Upland. We blurred his address and birthdate as a favor. The photos are presented as thumbnails; click on them for a larger, readable view. “I remember standing in line on 3rd Avenue queued up for quite a while for some of the more popular movies,” Guerin says. “The Beach Party films were all Pal Club movies and I remember enjoying them. [Manager] Gene Harvey would indeed come on stage and introduce each film. According to the card (as best I can read it): “In accepting Pals Membership, I promise to conduct myself in an orderly manner and to observe the Grove Theatre Rules.” According to the reverse, to every fourth movie you would be admitted free, and on your birthday “you and Mom & Dad or a pal” would also get in free. I love the YU in the phone number! I wish the Fox Theater in Pomona would have had such an accommodation since some of my “pals” and I were there on many a Saturday. We had NA phone numbers. It didn’t really matter what movies were playing. Most of the time we had no idea what we were to see until we got there. A cartoon, the newsreel, a sing-along of “God Bless America” with Kate Smith, and two – count ’em – two movies. Popcorn, soda, or ice-cream bought during the intermission. All for less than a buck. Which we had earned by doing chores. The Grove Theatre STILL has Saturday children’s plays. The Village Theater in Claremont didn’t have a club, but Saturday matinees were only a quarter (50s-60s) — same as a gallon of gas. Friends of the Pomona Fox still does periodic screenings at the historic theater. Our next one will be Abbott & Costello Meet Frankenstein on Sept. 9 at 2:00 pm. We don’t do double-features but we do show some interesting “extras” and we’re cheap ($8 for adults and $3 for kids). AND we usually do some door prizes and will have a panel discussion for those interested in learning more about the film. In some drawer I think I still have my Rancho Cucamonga (actually, I think it said San Bernardino County) library card, from the old Lions Center one-story branch. Not quite as nostalgic, but it might have had the 714 area code. We had the LY prefix while living on Roosevelt. Hit the big time in 1958 when we moved to Upland and got the YU prefix. Many of my early film memories are of watching the latest Disney offerings at the Granada or seeing John Wayne’s newest epic at the Valley (Ontario), Bel-Air (Fontana), Mt. Baldy (La Verne), Mission (Montclair), Rubidoux, and Magnolia (Riverside) Drive-Ins. But the Pal Club was a regular Saturday haunt. Maybe my favorite memory was once when my parents dropped us off at the Grove. I was 11 but tall for my age (much taller than my 13-year-old sister). The woman at the ticket booth didn’t believe us and wanted to charge me the 50 cent admission price, upsetting my sister greatly. “He really is 11; my parents only gave us enough to get in!” The woman relented and we went in to enjoy another great double feature. 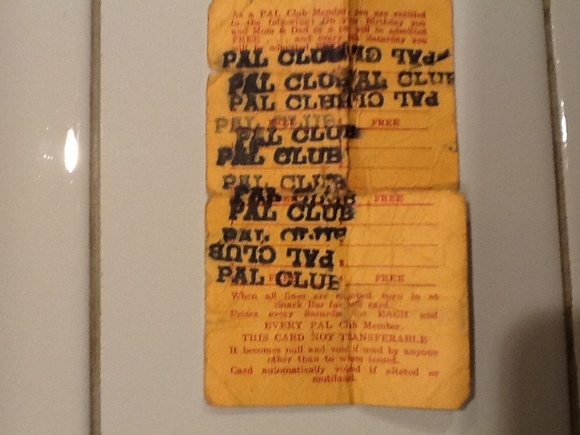 I was a member of the PAL Club in the 60’s. I really liked the James Bond movies and the old sci fi’s, like the monkey who was turned into a giant gorilla, and subsequently killed by the authorities for posing a menace to society (a real tearjerker for me). I even won one of the talent shows held at intermission (by default, most likely) by singing “10 Little Soldiers.” My older brother put me up to it, probably coveting one of the free passes I won. Good times.